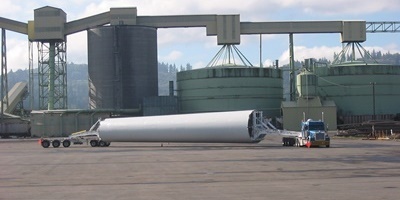 Aspen’s W-Series (Wind Series) are wind tower section hauling trailers which serve the wind energy industry. 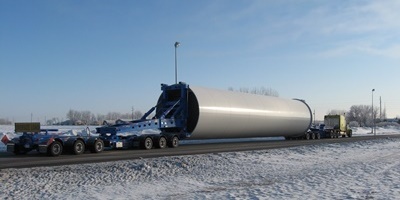 Configurations vary from payloads of 35 tons through 85 ton capacities, with axle configurations ranging from 7 through 13 axles (including truck axles). 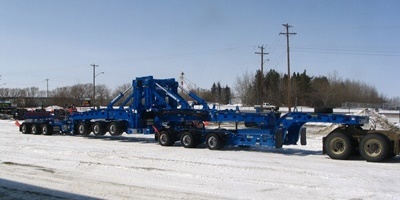 Aspen W-Series transporters feature front and rear Schnabel necks or front Schnabel with a rear saddle mounted on another type of hauling unit. W-Series trailers have common air/regulated air suspensions or walking beam (trunnion) suspensions with transporter equalization achieved by a mechanical equalizing steerable dolly or a 3 axle rear dolly equipped with a saddle. Aspen’s W-Series was designed from the load down to maximize payload capacity and minimize tare weight. The W-Series takes advantage of Aspen’s “flex frame” design which allows the frame to flex in all of the right places to allow frame deflection without breaking in key areas of the trailer. Experienced Design … Aspen’s W-Series is meticulously designed by Aspen engineers with over 240 years of combined trailer engineering knowledge. Not only is engineering knowledge important, but the combination of specific trailer industry experience and mechanical engineering knowledge makes our product one of the best trailer brands in the industry. Aspen’s Schnable necks have easy to understand and operate controls for the towers all operable from the ground for safe, effective operation of the units. This makes for safer and more efficient operators which gets you unloaded and back on the haul sooner and safer than the competition. Aspen’s design allows you to easily adjust the masts to suit the full range of tower diameters on the market today. This means you’ll always have the right equipment to get the job done with no missed loads. Aspen’s design makes use of wired power pack controls allowing your operator to stand back from the dangerous load and unloading activities which is safer and more efficient.